SLE is a multi-organ autoimmune disease that affects women of childbearing age. Renal involvement in the form of either active lupus nephritis (LN) at the time of conception, or a LN new onset or flare during pregnancy increases the risks of preterm delivery, pre-eclampsia, maternal mortality, fetal/neonatal demise, and intrauterine growth restriction. Consequently, current recommendations advise that the affected woman achieve a stable remission of her renal disease for at least 6 months before conception. Hormonal and immune system changes in pregnancy may affect disease activity and progression, and published evidence suggests that there is an increased risk for a LN flare during pregnancy. The major goal of immunosuppressive therapy in pregnancy is control of disease activity with medications that are relatively safe for a growing fetus. Therefore, the use of mycophenolate mofetil, due to increasing evidence supporting its teratogenicity, is contraindicated during pregnancy. Worsening proteinuria, which commonly occurs in proteinuric renal diseases toward the end of pregnancy, should be differentiated from a LN flare and/or pre-eclampsia, a pregnancy-specific condition clinically characterized by hypertension and proteinuria. These considerations present challenges that underscore the importance of a multidisciplinary team approach when caring for these patients, including a nephrologist, rheumatologist, and obstetrician who have experience with these pregnancy-related complications. This review discusses the pathogenesis, maternal and fetal risks, and management pertinent to SLE patients with new onset or a history of LN predating pregnancy. SLE is a multi-organ autoimmune disease that affects women of childbearing age. Early studies of women with SLE reported increased risks of preterm birth, hypertensive diseases of pregnancy and lupus flare, both during pregnancy and in the postpartum period. Reported outcomes were poor; consequently, therapeutic abortion was frequently recommended (1–4). Recent studies have reported more favorable outcomes, and patients are seldom counseled against pregnancy (5,6). Fecundity in SLE remains undiminished, save for the subgroups with antiphospholipid antibody syndrome (7) or advanced renal insufficiency (i.e., creatinine ≥3 mg/dl), or those women previously treated with cytotoxic alkylating agents. Given the increased maternal and fetal risks associated with lupus nephritis (LN), the clinician should be familiar with the pertinent issues related to its management before and during pregnancy. The pregnant state is characterized by hormonal modulation of both innate and adaptive immunity to establish maternal immune tolerance to a semiallogeneic fetus expressing both maternal and paternal antigens. During normal pregnancy, the number of CD4+/CD25+ regulatory T cells (Tregs) is increased. These cells have a potent immunosuppressive action and contribute to fetal tolerance. In addition, normal pregnancy is characterized by a shift from a Th1 cell-mediated to a Th2 antibody-mediated immune response (commonly referred to as Th2 polarization). This relative suppression of Th1 cell-mediated immunity mediates the maternal immune tolerance of the fetus (8,9). Immunologic changes may affect the incidence and severity of autoimmune disease and pregnancy outcome. For example, the number of Tregs is diminished in pre-eclamptic relative to normotensive pregnancies (9). Patients with SLE have fewer Tregs that also are functionally defective, which may confer increased risks for pre-eclampsia and maternal and fetal morbidity (10). In the setting of Th2 polarization, Th2-mediated diseases, such as SLE, may worsen during pregnancy. In addition, the risk for disease flare may be further enhanced by the hormonal changes of pregnancy, consistent with animal models suggesting that elevated estrogen levels are associated with increased lupus activity (11). These theoretical considerations are further supported by the clinical observations that pregnant women with SLE seem to be at increased risk of disease flare, although the implications of these immunologic changes on the incidence and severity of SLE are not fully understood. The incidence and prevalence of SLE are 1.4–21.9 and 7.4–159.4 per 100,000 people, respectively, although women are disproportionately affected, as reflected by a female prevalence of 9:1 (12). Reports of the effect of pregnancy on SLE activity are mixed, with some studies reporting a two- to three-fold increased risk of flare, whereas others indicate no increased risk (11,13–16). Measurable SLE disease activity is present in 40%–50% of pregnancies, with the most common manifestations being cutaneous disease (25%–90%), LN (up to 75%), arthritis (20%), and hematologic disease, including thrombocytopenia (10%–40%). Risk factors for a SLE flare include active disease within 6 months before conception, a history of multiple flares, and discontinuation of hydroxychloroquine (Figure 1) (14). Flares can occur at any gestational age, as well as in the postpartum period (17). Renal biopsy by electron microscopy of a 31-year-old woman with SLE for 10 years who presented at 6 weeks of gestation. Before pregnancy, she was managed with daily prednisone, hydroxychloroquine, and warfarin for a history of antiphospholipid syndrome. At her first visit, prednisone was continued, warfarin was changed to dalteparin, and hydroxychloroquine was discontinued. At 12 weeks, she presented with chest pain and shortness of breath. Evaluation revealed worsening proteinuria, hypertension, and altered renal function (creatinine 1.6 mg/dl from 1.0 mg/dl baseline). Renal biopsy (electron microscopy as shown) disclosed membranous GN. The prednisone dose was increased and hydroxychloroquine was restarted. At 15 weeks of gestation, she experienced shortness of breath due to pulmonary embolism, with subsequent cardiorespiratory arrest. After resuscitation, she was intubated, but developed oliguria unresponsive to diuretics. Continuous renal replacement therapy was initiated for fluid overload, and vasopressors were required. Fetal demise was documented, maternal evaluation was consistent with brain death, and support was withdrawn. 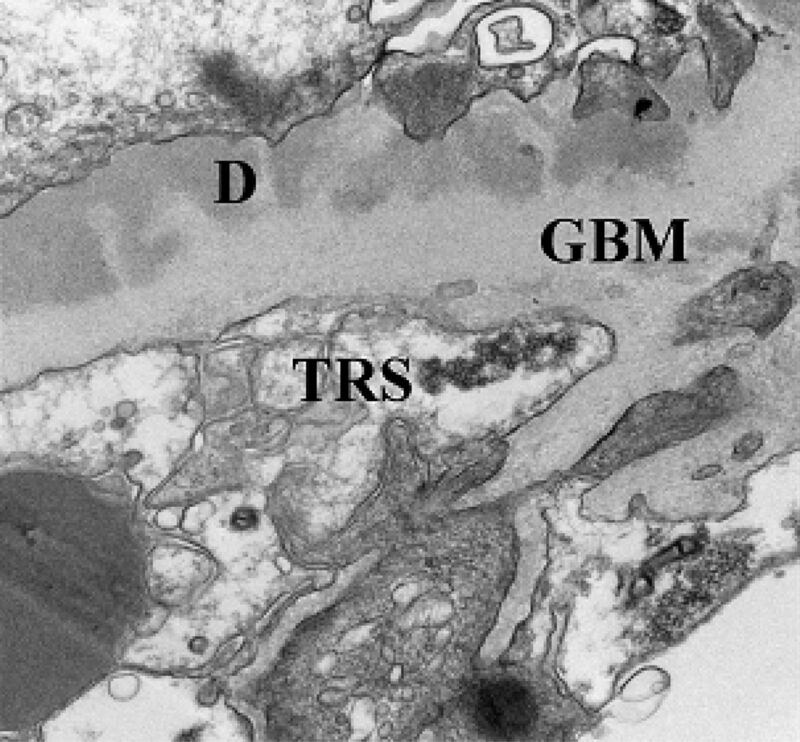 D, immune deposits; GBM, glomerular basement membrane; TRS, tuboreticular structure. SLE during pregnancy is accompanied by increased maternal and neonatal morbidity and mortality. The risk of pre-eclampsia ranges from 11% to 35%, although most reports show that the risk is closer to 30% (14,17–19) compared with a risk of approximately 5% in the general population. A recent study of 396 pregnancies complicated by SLE compared outcomes in pregnancies before and after the onset of SLE. Complications of pregnancy after the onset of SLE included an increased risk of fetal death (29.7% versus 14.2%) and preterm birth (26.7% versus 5.8%). Predictors of pregnancy loss included LN (odds ratio [OR], 7.3), the presence of antiphospholipid antibodies (OR, 3.9), and a SLE flare during pregnancy (OR, 1.9). Preterm delivery was associated with LN (OR, 18.9), anti-Ro antibodies (OR, 13.9), hypertension (OR, 15.7), and SLE flare (OR, 2.5) (20). These data have been corroborated by numerous other studies (19,21–25). Anti-Ro/SSA antibodies are associated with an increased risk of congenital heart block (1%–2%), neonatal lupus, and laboratory abnormalities, including hematologic (thrombocytopenia and neutropenia) and hepatic abnormalities (elevated transaminases), in asymptomatic infants within the first 27 days of life (26,27). Clinical remission of SLE activity and careful control of the disease are associated with improved outcomes, underlying the importance of careful monitoring of these patients throughout pregnancy (28–30). Important changes in renal physiology occur during pregnancy. Progesterone-induced smooth muscle relaxation and compression of the ureters by the enlarging uterus can result in a physiologic hydronephrosis, predisposing the pregnant woman to pyelonephritis and symptomatic urolithiasis. The GFR increases by 50% to 60%, with a subsequent increase in creatinine clearance of approximately 30%. Serum creatinine in a pregnant woman is lower than in a nonpregnant woman, and varies by trimester. Therefore, a serum creatinine of 0.9 mg/dl may suggest underlying renal disease (31,32). The progression of pregnancy in patients with pre-existing renal disease may be accompanied by an increase in proteinuria, and either de novo or worsening of existing hypertension (33). These should be differentiated from a new onset or LN flare and/or pre-eclampsia, a pregnancy-specific condition clinically characterized by hypertension and proteinuria, and its severe form, HELLP syndrome, characterized by hemolysis, elevated liver enzymes, and low platelet count (Table 1). Up to 75% of patients with SLE have clinically evident renal disease, which is one of the American College of Rheumatology criteria used for the classification of SLE (34). Active renal involvement is defined as the presence of active urine sediment (>5 red and white blood cells per high-powered field and/or ≥1 cellular casts) and/or proteinuria >0.5 g/d, with or without an elevation in serum creatinine. If conception occurs after a period of 12–18 months (minimum of 6 months) of remission, pregnancies generally have favorable outcomes (34). The relationship between LN and pregnancy outcomes is complex. Pregnancy may have adverse short- and long-term effects on kidney function, including an increased risk for LN flare and progression to ESRD. The risk for progression is determined in part by the severity of the underlying renal disease and is increased for patients with creatinine values >1.4 mg/dl (33). Underlying renal disease, in turn, places these pregnancies at higher risk for maternal and fetal complications, including spontaneous abortion, premature delivery, intrauterine growth retardation, and pre-eclampsia (35). Hormonal and immunologic changes in pregnancy seem to affect the activity of SLE in general, and LN in particular. Studies comparing flare rates between pregnant and nonpregnant patients have reported conflicting data (36–38). However, studies that have used a patient's own nonpregnant course for comparison have demonstrated an increased risk of LN flare during pregnancy (15,39,40). A recent meta-analysis reported rates ranging from 1.5% to 83% for a LN flare during pregnancy. The random-effect rate of LN flare was estimated at 25.6% (17.4%–33.8%) (41). Given the increased risk of maternal and neonatal morbidity associated with active LN (42), with the risk for flare as high as 70% (43), close monitoring with monthly assessments of disease activity is recommended. The risk of maternal morbidity is increased in the setting of active LN (11,23,44–47), including an increased risk of hypertensive disorders of pregnancy (42). A recent meta-analysis reported frequencies of 16.3% for hypertension and 7.6% for pre-eclampsia among pregnant LN patients. Active nephritis was associated with an increased risk of hypertension in pregnancy, whereas both active nephritis and a history of nephritis conferred increased risks of hypertension and pre-eclampsia compared with SLE patients without histories of LN (41). Although progressive renal impairment may occur, it is generally mild, and ESRD requiring hemodialysis is rare, even in patients with active LN (14). The risk of severe morbidity, including eclampsia, stroke, and maternal death approached 1%, although statistical significance was achieved only for maternal death (41). Importantly, a recent review of the literature identified 17 cases of maternal mortality in pregnancies with LN. In all patients, death occurred in the setting of active renal disease, with infection and SLE complications being the two most common causes, accounting for 41.2% and 29.4% of all deaths, respectively. This emphasizes the importance of planning pregnancy, judicious use of immunosuppressive therapy, and the need for expert monitoring (48). Fetal and neonatal morbidity and mortality may also be increased in pregnancies complicated by LN. Although a recent study reported that LN does not lead to worsened fetal outcomes (42), others report increased risks of preterm birth (39.4%), intrauterine growth restriction (12.7%), stillbirth (3.6%), and neonatal death (2.5%). Data are insufficient to clarify the effect of kidney function and the amount of proteinuria at the start of pregnancy on maternal and neonatal outcomes (41). Children born to mothers positive for anti-SSA/Ro and anti-SSB/La antibodies are at risk for congenital heart block. These pregnancies should be monitored by fetal cardiac auscultation, echocardiography, and neonatal electrocardiography after delivery (49). Antiphospholipid antibodies, including lupus anticoagulant and anticardiolipin antibodies, are autoantibodies that bind to cardiolipin and/or β2 glycoprotein-I bound to phospholipids. The presence of these antibodies, in association with venous or arterial thromboses and/or pregnancy complications (e.g., recurrent miscarriages), constitutes antiphospholipid syndrome (APS). Both the presence of antiphospholipid antibodies and APS are frequently seen in association with SLE, with pregnancy complications including fetal loss, which generally occurs after 10 weeks of gestation, and an increased relative risk of pre-eclampsia (50,51). A meta-analysis reported the presence of antiphospholipid antibodies in approximately one-quarter of lupus pregnancies (41). Because the risk of pregnancy loss has been correlated with the number of positive tests for different antiphospholipid antibodies, screening for the presence of these antibodies during the initial evaluation of all lupus pregnancies is recommended (52). The mainstay of management is anticoagulation (see Medical Management: Chronic Anticoagulation), which seems to improve both maternal and fetal outcomes. Immunosuppression is reserved for those who, in addition to APS, have active SLE. Women with a history of APS and arterial thrombotic events should be advised against pregnancy due to high risks for not only pregnancy loss, but also stroke and maternal morbidity and mortality (17). For these women, gestational carriers can be considered as a means of achieving parenting goals without taking risks related to their own child bearing. Because oocyte retrieval exposes women to high doses of estrogen, which may increase the risk of flare, it should be performed during disease remission (53). The goal of preconception counseling should be to bond with the patient in pursuit of optimizing her health before becoming pregnant. Fecundity may be decreased by the presence of antiphospholipid antibodies, progressive renal insufficiency, and previous treatment with cytotoxic alkylating agents. Before attempting to conceive, teratogenic immunosuppressives should be changed to those most appropriate for pregnancy (Table 2). Similarly, antihypertensives with adverse fetal effects, such as angiotensin converting enzyme inhibitors and angiotensin II receptor blockers, should be changed to alternatives safe for use during pregnancy. Systemic activity of SLE must be assessed, with careful attention to renal involvement. A recent LN flare is a risk factor for recurrence; consequently, renal function should be stable without evidence for an active LN flare for a minimum of 6 consecutive months on a medical regimen that is safe to continue throughout pregnancy (12). The first visit should include a physical examination, BP measurements, and a baseline laboratory evaluation (Table 3). Renal biopsy data should be incorporated into the counseling session (32). World Health Organization LN classes I, II, and V are known to have low activity and chronicity indices, whereas classes III and IV tend to be more aggressive and are associated with an increased incidence of LN flare (54,55). A prospective study reported an increased incidence of hypertension and pre-eclampsia in patients with class III or IV LN (37.1%), compared with either class II or V nephritis (11.1%), or age, parity, and duration of lupus-matched controls without renal involvement (11.6%). These findings suggest that LN classes III and IV may be associated with an increased risk for hypertensive disease (56). The meta-analysis that followed did not report a statistically significant association between histologic subclass and rate of unsuccessful pregnancy (41). This observation needs to be interpreted within the limitations of the meta-analysis, including a limited amount of data available for correlative studies between LN classes and pregnancy outcomes, and the fact that most of these renal biopsies were performed years before the pregnancies that were analyzed. Consequently, uncertainty remains as to the implications of the World Health Organization classification in pregnancy, suggesting that careful antenatal surveillance in the patients with proliferative LN forms is indicated. Pregnant patients with SLE and LN are best managed throughout pregnancy by a multidisciplinary team, including an obstetrician (optimally a maternal fetal medicine specialist), a rheumatologist, and a nephrologist (Figure 2). Baseline laboratory studies (Table 3) may be repeated at the first prenatal visit and should certainly be obtained if no preconception counseling took place. Monthly prenatal visits are indicated, with the frequency of laboratory testing depending on the activity of SLE/LN. Serial fetal ultrasound examinations are indicated to monitor fetal growth. Consideration should be given to consultation with an anesthesiologist regarding intrapartum analgesia in cases with evidence of thrombocytopenia or coagulation abnormalities. 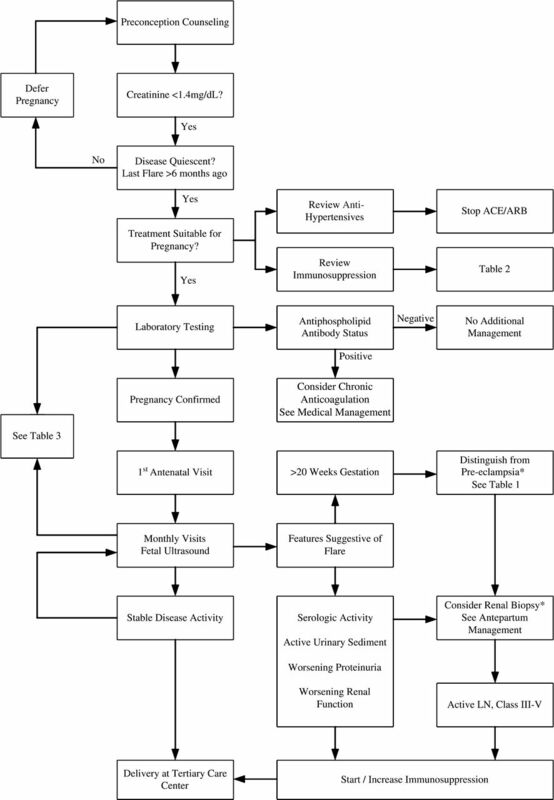 Flow diagram of the management of lupus nephritis in pregnancy. *For a confirmed diagnosis of pre-eclampsia, delivery is the only definitive treatment option. ACE, angiotensin converting enzyme inhibitor therapy; ARB, angiotensin receptor blocker therapy; LN, lupus nephritis. The distinction between the onset of active LN and pre-eclampsia can be challenging because both diseases share common manifestations, including hypertension and increasing proteinuria (Table 1). This distinction is critical because LN is managed with immunosuppression, whereas delivery, even remote from term, is indicated for severe and superimposed pre-eclampsia. A number of biomarkers have been associated with increased LN activity, although validation is required before using them to differentiate LN from pre-eclampsia (57–59). Renal biopsy should be considered if the laboratory evaluation is nondiagnostic. A biopsy can be safely performed in patients with adequate BP control and normal coagulation parameters to achieve a definitive diagnosis and inform treatment decisions (60). Typically, renal biopsy is not advisable after 32 weeks of gestation. The risks and benefits of biopsy versus delivery should be considered with the obstetrical and neonatal providers. Although early studies reported high complication rates, including gross hematuria in 16.7% and perirenal hematoma in 4.4% (61), more recent series report similar complication rates to nonpregnant women (62,63). In the first and second trimesters of pregnancy in patients with SLE, diagnosed either before or during pregnancy, renal biopsy may facilitate the initiation of disease-specific treatment, rather than empirical treatment, which can be advanced postpartum to include immunosuppressive agents that are otherwise contraindicated during pregnancy. Empirical treatment can be considered under special clinical circumstances such as in patients who present with active urine sediment, proteinuria, and serological abnormalities, who either have an established diagnosis of LN based on a previous kidney biopsy or who refuse the procedure. Antepartum management of patients with histories of LN should focus either on the treatment of active disease or on prevention of a LN flare. Given the additional concerns related to the developing fetus, consideration must be given to the pregnancy-related safety and efficacy of the medications commonly used to manage LN (Table 2). Pregnancy is a hypercoagulable state, and the risk for thrombotic events is further increased by the obstruction of venous return by the enlarged uterus. Therefore, anticoagulation is indicated for all SLE patients positive for antiphospholipid antibodies and a history of thrombotic event(s), regardless of whether they were receiving anticoagulation before pregnancy. Because warfarin is contraindicated during pregnancy due to its teratogenicity and potential for life-threatening hemorrhage in the infant (64), patients treated with warfarin should receive therapeutic anticoagulation with either unfractionated heparin (UFH) or low molecular weight heparin (LMWH) when pregnant. In the absence of a previous history of thrombotic event(s), prophylactic anticoagulation, consisting of a low dose aspirin (81 mg/d), with either UFH or LMWH, should be initiated for pregnant women meeting the obstetric criteria for APS, such as ≥3 pregnancy losses or a late pregnancy loss. For women with antiphospholipid antibodies who do not meet the clinical criteria for APS, an acceptable approach is close clinical surveillance; other options include antepartum aspirin, or prophylactic UFH or LMWH. In the absence of antiphospholipid antibodies, prophylactic anticoagulation should be considered for pregnant LN patients with nephrotic syndrome, because the hypercoagulable state inherent to nephrotic syndrome may worsen further with pregnancy, leading to an increased risk for thromboembolic complications (65). As for all other patients in whom anticoagulation is initiated during pregnancy, heparin should be started immediately after confirmation of an intrauterine pregnancy, and continued for at least 6 weeks postpartum. For the specific therapeutic and prophylactic anticoagulation regimens, therapeutic goals, and monitoring strategies, please refer to the American College of Chest Physicians evidence-based clinical practice guidelines on venous thromboembolism, thrombophilia, antithrombotic therapy, and pregnancy (65). In pregnant patients with SLE, immunosuppressive therapy is indicated as induction therapy for either flare, new onset disease, or maintenance therapy for patients in remission. Therapeutic options for LN, commonly based on the renal biopsy results in nonpregnant patients, are limited. For example, mycophenolate mofetil and cyclophosphamide, frequently used for proliferative forms of LN, are contraindicated during pregnancy. Both induction and maintenance regimens are commonly based on corticosteroid therapy, azathioprine, and calcineurin inhibitors (e.g., cyclosporine and tacrolimus), which have acceptable safety profiles in pregnancy. In addition, membranous LN (class V) ideally would be treated with renin–angiotensin blockade, but these agents are contraindicated in pregnancy. Specific pros and cons for each class/agent with respect to their use in pregnancy are as follows. Their efficacy in the management of LN is well established, and prednisone and prednisolone are appropriate for continued use throughout pregnancy. Low doses (5–10 mg/d) are unlikely to cause adrenal insufficiency and thymic hyperplasia in infants (66). Because dexamethasone and betamethasone both cross the placenta and reach the fetus at high concentrations, their use is best reserved for obstetrical indications only (67,68). Corticosteroid use had been associated with orofacial clefts during pregnancy in both animal models and human patients (69,70). However, a recent large-scale, population-based study from Denmark did not confirm this association (71). Several reports have supported the safety and efficacy of its use in pregnancies complicated by LN, and its discontinuation in gravid patients increases the risk of lupus flare (Figure 1) (72–76). An international multidisciplinary expert panel has advocated its use as first-line maintenance therapy in pregnancies complicated by LN (68). Azathioprine use in pregnancy has been studied predominantly in women with inflammatory bowel disease, and in those with prior renal transplantation. A retrospective cohort study of 476 women taking azathioprine early in pregnancy reported an increased risk of ventricular and atrial septal defects, as well as preterm birth (77). As a result, the US Food and Drug Administration (FDA) assigned azathioprine to category “D.” Data regarding the use of azathioprine in pregnancy complicated by SLE are limited to one cohort of 31 pregnancies. The authors reported favorable outcomes and, consequently, recommended azathioprine for the treatment of SLE/LN in pregnancy (14). Despite the FDA category, in patients with disease well controlled with azathioprine, treatment may be continued during pregnancy to minimize the risk of flare. Experience with cyclosporine and tacrolimus in pregnancy comes primarily from studies of renal transplant patients. Cyclosporine is more commonly used in pregnancy than tacrolimus, due to longer experience and data from experimental models and human studies suggesting its safe use during pregnancy (68). With respect to tacrolimus, although only rare fetal effects have been documented with its use, the risk of pre-eclampsia, relative to cyclosporine, may be increased (78). The increased volume of distribution with the progression of pregnancy may result in low maternal levels of either tacrolimus or cyclosporine; doses may need to be adjusted based on trough blood levels. Consideration for using tacrolimus over cyclosporine for induction should be given, on the basis of data suggesting comparable rates of remission achieved with tacrolimus compared with the regimen with cyclophosphamide (79). Although these data are insufficient to recommend the use of tacrolimus for induction in the general population, they may support tacrolimus use for pregnant patients for whom mycophenolate mofetil and cyclophosphamide are contraindicated. To date, evidence supporting its efficacy in the management of LN during pregnancy is promising, but limited (80). Intravenous Ig (IVIG) has demonstrated benefit in nonpregnant patients with LN (81,82). Caution should be given particularly to sucrose-containing IVIG because it has been associated with renal insufficiency, although this association was not noted in a review of the use of IVIG in nonpregnant LN patients (82). Although more evidence is necessary, the use of IVIG may be reasonable in LN flares refractory to other treatment modalities. With a mounting body of evidence indicating its teratogenicity, the drug was recently downgraded from FDA pregnancy category C to category D, implying that its use in pregnancy should be avoided (83,84). Although assigned to the same category as azathioprine, the risks associated with mycophenolate mofetil are much higher, and azathioprine is a safer alternative in patients who require treatment during pregnancy. Its teratogenicity has been documented in human and animal studies, and consequently, its use should be restricted in women who have not completed childbearing (14,68). However, recent studies report its safe usage as part of the management of breast cancer, during the second and third trimesters of pregnancy, without any significant fetal complications (85). Many physicians continue to avoid using cyclophosphamide where possible, but these reports suggest a potential benefit, particularly in high-risk cases. Rituximab is a monoclonal antibody directed against CD20 that is being studied for use in SLE and LN (86,87). Because data regarding its safety in pregnancy are lacking, rituximab should be avoided until its safety and efficacy have been demonstrated. Methotrexate is a well established teratogen and is contraindicated in pregnancy. Methotrexate should be discontinued at least 3 months before conception (88). Decisions regarding the timing and mode of delivery should be made in conjunction with an obstetrician with experience in managing labor in the setting of renal disease. Delivery may be best in a tertiary care center where neonatologists are available, particularly if a patient is likely to deliver before 37 weeks of gestation. Cesarean section should be reserved for obstetrical indications. If the patient is breastfeeding, consideration should be given to the safety of immunosuppressive medications for the infant (Table 3). The patient should be followed postpartum with regular visits, because LN flare may occur. In summary, available evidence suggests that SLE and LN in pregnancy confer increased risks for neonatal and maternal morbidity. However, pregnancy outcomes can be optimized if appropriately managed by a multidisciplinary team of physicians, with appropriate preconception counseling and surveillance. The project described was supported in part by Award K08HD051714 (V.D.G.) from the Eunice Kennedy Shriver National Institute of Child Health & Human Development. The content is solely the responsibility of the authors and does not necessarily represent the official views of the Eunice Kennedy Shriver National Institute of Child Health & Human Development or the National Institutes of Health. Practice Bulletin No ACOG; American College of Obstetricians and Gynecologists Committee on Practice Bulletins-Obstetrics: ACOG Practice Bulletin No. 118: Antiphospholipid syndrome. Obstet Gynecol 117: 192–199, 2011.